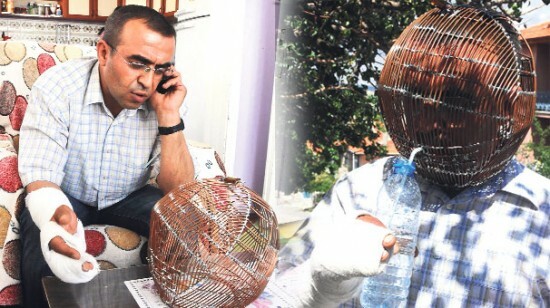 A Turkish man has locked his head in a metal CAGE in a bid to give up cigarettes. Ibrahim Yucel, 42, decided to kick his 40-a-day habit after his dad died of cancer. When his attempt to go cold turkey failed, he decided to build the bizarre medieval-style headgear from 130ft of copper wire. Every morning he’s sealed inside the cage by his wife and 14-year-old daughter who each have a set of keys.